Groundhog Day only comes once a year and so does this offer! 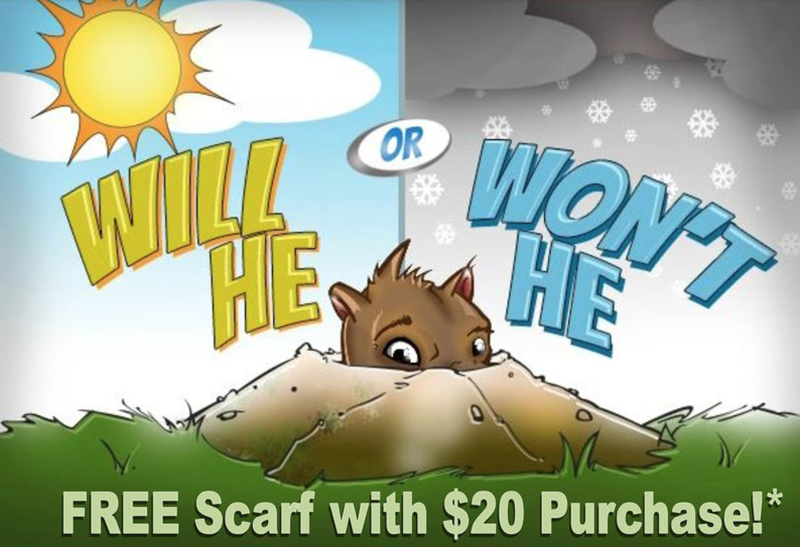 -If Punxsutawney Phil sees his shadow, receive a FREE Winter Scarf! – If Phil doesn’t see his shadow, receive a FREE Summer Scarf! Please mention secret password “Go Groundhog” or show this offer on your smartphone to receive your FREE scarf. *Cannot forget the details. Qualifying total is AFTER all discounts or coupons have been applied. Join us Monday to Celebrate Groundhog Dog with FREE Scarves for you! A big THANK YOU for shopping locally with independent stores like Adrians Boutique, we truly appreciate each and every one of our customers.